While most people know Pixel's work from the excellent Cave Story, that's not the only game he's ever made, and exploring his lesser known titles can be a lot of fun in itself. Ikachan is one such title, released as freeware for the PC in 2000. 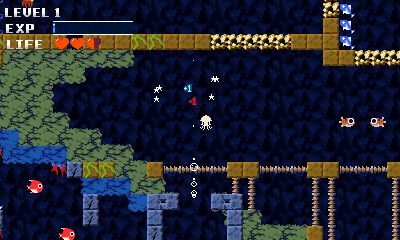 That's four years before Cave Story, and you'll definitely see some overlap in terms of graphics, storyline and even some characters between the two releases. Ikachan casts you as the titular squid-like creature. When the game begins you wake up in a cavern with no idea of who you are or what you're supposed to be doing — sound familiar? By exploring and speaking with friendly sea creatures you'll come to learn, piece by piece, exactly what's happening here, and what you'll need to do to help. The narrative style is similar to Cave Story's, as the plot is never exactly spelled out for you. You'll learn tidbits here and there, and get given guidance on what you need to accomplish next, but the player will have to fill in a lot of blanks and assemble the pieces separately in order to gain a complete picture of what's happened here. For those who enjoyed that sort of passive narrative approach in Cave Story, this is a shorter but still rich attempt at the same. For those who were frustrated or confused by it, don't expect much different of Ikachan. In fact to say anything about the story would be to spoil at least some of it, as the experience itself is incredibly short; we therefore wouldn't want to rob you of any of the possibility for discovery. Front to back the adventure lasted, for us, exactly one hour. That involved a lot of backtracking and level grinding as we had no idea what to expect, and we're sure that foreknowledge could reduce the playtime down to around thirty minutes, without rushing. This abbreviated runtime is Ikachan's biggest drawback, but it's not its only one. Great concepts and big potential lie almost entirely untapped, as you guide Ikachan around and around a very tiny map, chatting repeatedly with the same NPCs, until the game's one and only boss fight occurs and the game ends. We don't mind short gaming experiences here at Nintendo Life, but we tend to enjoy the ones that offer something memorable. Ikachan comes close, but doesn't quite accomplish that. Ikachan controls understandably for a squid; he can only propel himself in the way his head is pointing, and he cannot point downward. 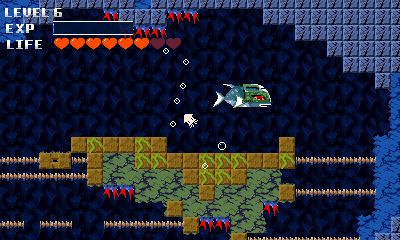 A press of the A button causes him to swim slightly in that direction, and pressing nothing causes Ikachan to sink down. As you explore the teeny tiny map you'll encounter bizarre structures that award you with upgrades, a la Metroid. However there are only a handful of these, and none of them get the chance to shine before the game so abruptly ends. You'll need to avoid spikes and aggressive sea creatures until you find the upgrade that allows you to attack them by swimming into them. Once you do you can kill them for experience points, and earning enough experience will give you a higher level, which increases your attack power and health. This lends an RPG-element to the game, but again it doesn't really get the chance to be enjoyed, as we beat the game with a measly level 5 character, and that included a lot of grinding that turned out to be unnecessary. Graphically it all looks nice, though the 3D effect contributes nothing except placing a nice backdrop further into the distance. It implies a scope and depth to the game world that the game itself doesn't quite support, with its small amount of cramped rooms and corridors. The music is understandably great, but the fact that one single song plays through nearly the entire experience hinders enjoyment a bit. 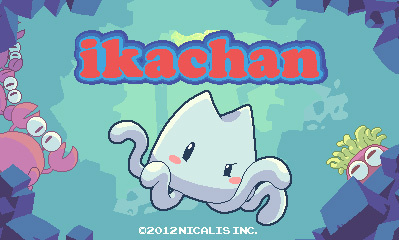 Ikachan is not a bad game, but there's very little to recommend it apart from its pedigree and connection to Cave Story. There's not much to explore, no real challenge, and no reason whatsoever to come back. It introduces concepts that depart almost immediately, and does not provide optional objectives, and its lone boss fight is criminally easy. It may be worth taking a dip, but don't expect much depth. Hmm... I thought they'd at least expand the story a bit. Definitely not worth $5, Gunman Clive is longer than this and costs LESS! I expected a 7-9 from this game. Oh well. "There's not much to explore, no real challenge, and no reason whatsoever to come back. It introduces concepts that depart almost immediately, and does not provide optional objectives, and its lone boss fight is criminally easy." I don't mean to be negative but how does this receive the same score as The Cave? You go from giving good games like the Denpa Men a 9 (which is a bit generous) to being overly harsh on a game like the Cave (I think a 7.5 would have been more reasonable). am I the only person who actually prefers short, sweet game experience instead of padded-out long ones? Well, I at least expected a 5 knowing. Was really hoping Nicalis at least added some extra elements (3D effects aside) to this game. $2 would be more reasonable or $3, but it seems that Nicalis is banking on Pixel's fame. 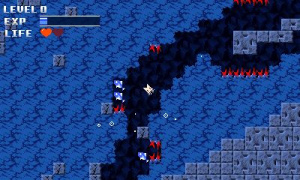 They're planning to release Guxt, a shmup by pixel. I just hope they price it reasonably. Oh, Phil. How I disagree with this score. This game is more about the unique atmosphere and children's-book-charm than anything else. It isn't supposed to be challenging. At the very least, I think it's a showcase of Pixel's ability to craft games of a look and feel completely his own. This is coming from my experience with the game as a free PC download, though. As far as I can remember, it can be beaten in a couple hours. I'll concede it doesn't lend itself to a paid release. lol Phil the conclusion. WHY YOU USE PUNS?!?!?! Agreeing with Kholdstare to a tee. Yeah, I heard this one wasn't that great. Looks like good fun, though, and for $5, I'll get to it someday. ...But it's nowhere near as good as Cave Story was, and I dunno if it'll sell as well either. Yeah, I'm definitely passing on this. @Windy You guys STILL don't have it? Wow. @Windy: Nicalis is an American publisher. It may be difficult for them to release in Europe. I'll still probably buy it simply because Pixel made it. Another lazy Nicalis port. #3 best developer alright. And they said they were gonna jazz it up with new content. What a joke. It'll probably never even reach the PAL eShop, and if it does, I'll pass. If only this was a two dollar game I might bite but five for a shallow experience sounds steep. I was going to pick this up, but since this is just another lazy port by Nicalis I'm going to wait until the inevitably make another 5 versions of it that only add one more thing that people wouldn't even consider new like just swapping out the character sprite and calling it a new campaign. Thanks for the review, now I know I can just pick up the free PC version and get the same experience. I'm a bit sad the game is rather short, but I'll still get it in the long run. My 1st playthrough of Cave Story, magical. Now its just fun to play. I'll get this for a rainy day, I guess, but since I felt shorted by VVVVVV and NightSky, it's nowhere near the top of my "games to get" list. @Birdman From the sounds of things, VVVVVV and NightSky are far more rewarding than this. Seriously, talk about the Capcom of indies. @theblackdragon Ikachan probably won't get a real remake, considering that well, THIS is the remake. @TheDreamingHawk This isn't a remake IIRC. This is a port. Way overpriced. They port a short free-on-pc game and charge $5? Are they crazy or what? And Cave Story hasn't been released in Europe yet, you know what? Screw them, if it finally reaches our shores, I won't buy it. They are lucky though, I'll probably get VVVVV sooner or later but I'm not sure about it, they don't deserve it. Ouch, sounds like this is more of a proof-of-concept demo than a full game. I guess I'll just be spending my money on Witch's Cat (Rabi Laby Gaiden) and Bloody Vampire this week. Where is cave story for europeans? 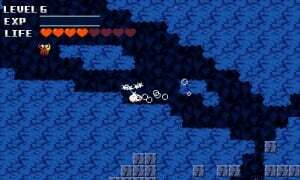 @Phillip_J_Reed You've been lost me when you made countless comparisons to Cave Story. You even said it yourself; Cave Story came AFTER this. Comparing Cave Story to Ikachan makes sense; comparing Ikachan to Cave Story does not. So, as it turns out, our little squid is anything but titular afterall. This word has been abused, of late. 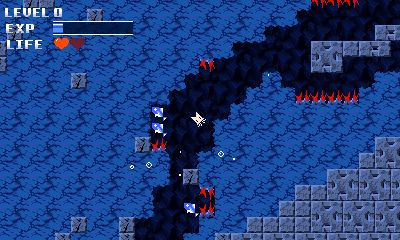 I enjoyed Cave Story on my DSi and its quality merits the $9.99 spent, but Nicalis is asking way too much for this. Lest they start making fans [really] angry, they should wisen up and start pricing releases like this one more reasonably. Good review as always, Philip. I think I'll still get it, but I may have to adjust my expectations. You've been lost me when you made countless comparisons to Cave Story. You even said it yourself; Cave Story came AFTER this. Comparing Cave Story to Ikachan makes sense; comparing Ikachan to Cave Story does not. It makes sense for the reason that Cave Story is by far the more universal reference point for most gamers, and explaining similarities between the games is meant to give readers a better understanding of how Ikachan works. Thank you for not spoiling the story. @DarkKnight - That's why it's really not up there on my list. I thought releasing this was stupid to begin with. It's a great little game still. Everyone should download the freeware PC version! That's a shame, I was hoping Nicalis and Pixel might use this as an opportunity to refine the game a bit. Oh well, I'll still probably get it at some point, but just not anytime in the immediate future. Nicalis, how mediocre you have become. @edhe What's sadder is that that isn't all of the ports total. @Chrono_Cross How mediocre you have started is more like it. I don't consider porting to be a feat of any major greatness, even if the games are as amazing as Cave Story. @Windy Well, I live in Europe and I appreciate your choice to boycott this game-even if you don't need to- very much. All I want is to play Cave Story on a portable system but it seems I'll never get to do so...And I would most probably buy all the other games Nicalis hasn't yet released in Europe if given the choice. I was afraid of this. Overall it still sounds worth a go for it's pedigree alone. I'll get it eventually, but not right away. So, let me get this straight; I can purchase this game for $5 or I can get the exact same thing on PC for free? Huh. Yeah, I'll probably just download the free PC version if there are no extras and it is really short. Maybe I'll pick this up a little later. Most of the games Nicalis develops aren't anything above average. If this was $2 or $3, I would have bought it. Oh well. I did a Google search for a mac version of Ikachan and can't find one. Does anyone know if one exists? Must. resist. cuteness... money... not... WORTH IT!!! I've wanted Ikachan since I read it in Nintendo Power. Sad as it is, I will get it either way. @Frozenx07 Same place as the MAC Mega Man X Street Fighter crossover, unfortunately... My Macbook Pro wants to play, too. @Chrono_Cross Well, since you said develop, I'll agree with that since they only developed one crappy iOS game. But the ports? Those are great games IMO, they're just tarnished by the lazy, glitchy port jobs and immense whoring that Nicalis does. Cave Story in particular I consider a masterpiece of Metroidvania platforming, as linear as it is. VVVVVV is overrated but still fun, and NightSky is for the atmosphere moreso the gameplay I believe. Had they published La-Mulana I'd definitely agree but they backed out in the most detestable way possible. Regarding the length of the game. I've obviously played Ikachan an inordinate amount during development. We've also had a significant number external players go through the game. The average first-time for most players, including really good gamers is about 2-3 hours. If you were able to beat the game in an hour your first time through, that seems very uncharacteristic as the world is fairly large. We priced it at $5 with the assumption that players could get 2-3 hours their first time through the game. That's about $1.50-$2.50 per hour. I, personally, don't mind paying $15 for something like Journey, which is also only a two hour experience. Take this all as my own opinion, I can't feel that you might be misrepresenting the game as it sounds like a review of the PC version and not 3DS version. I also can't help put to feel you're putting a rating based on price ($5) and not the game's own merit. Would you have scored it higher if it was .99? I'd say probably, yes. Thanks Tyrone. I will of course confirm that the 3DS version was played for review (see our FTC disclosure above), and that the rating was in no way based on price. We appreciate the comment! what have we done to be considered so stupid? I mean... we (european) nintendo customers? @tyrone - Thank you for saying what you added. Maybe I'll give a download, after the early buyers check for glitches. After beating the PC version, I am sad to say that my playthrough was indeed an hour long. I sadly wish it would have been comparable to Cave Story in length, and the pricetag for a free PC game is a little too steep for the content, but I would love to visit the world of Ikachan if a sequel ever came out. Too bad, I was would of bought this game for the game and for some club nintendo coins, but it's not worth it. @Collision_Cat Worst person ever, trying to make money to live off of. For shame. I mean $5, that's like.... 20 minutes of pay. He's a criminal! OFF WITH HIS HEAD! Slightly polished foreground graphics (there are edge tiles lining walls now). A neat lighting effect in the background. A handful of new corridors here and there, populated by all-new enemies. Revised GUI (there are hearts and bars now instead of just numbers). Some enemies have been retouched a little (ie: crabs' pincers are a different color now). Slightly expanded story (some dialogue was rewritten to make the plot and backstory a little deeper). Revamped ending/credits sequence complete with all-new art. Yeah, it's still a short game, but I think it compensates that with lots of charm. At just $5, I think it's worth it, especially if you enjoyed Cave Story. Every game that isn't NightSky, is below average at best. Yes, even Cave Story. @Chrono_Cross Well, I'll have to disagree with that. I actually liked NightSky the least, but that I felt was a much more artistic game. Also, over Cave Story, what's a better example of Metroidvania-style platforming in your opinion? Even with the linearity, it's better then, say, Shantae: Risky's Revenge (the other highly revered indie example I can think of) and has far less flaws. VVVVVV is overrated, I'll be fair about that. @tyrone Thanks. Now I feel better to buy it. CUTE CREATION FROM JAPAN... MOVE ZIG!!! CUTER THAN ALL THE POKEMON. @Collision_Cat they did it with Cave story too. The greedy basterds. Who do they think they are, Capcom? They can't get away with releasing the same game over and over and over again. @rayword45 cave story isn't metroid vania. It's just a 2D shooter. It's been only eleven months and no European release, typical Nicalis behaviour. 43 minutes long. Including my deaths, the credits and time on the title screen. Glad I waited for a sale. Cute but I'm not sure I'll play it again anytime soon. Fun despite that. Maybe I'll let friends try it. Bought this when it was on sale recently. Took me about 1 1/2 hours to beat. It's a fun game in spite of its short length, and I really enjoyed it.